A project has its "start" and "end". During the period in which people participate in it and attain a certain specific target, much energy, namely labour forces, are input. They increase as the project goes on, while achieving results, and after reaching their peak, the amount of input of labour forces decreases toward the termination. This segment is defined as a "phase", and in many industrial projects, as shown in Table 4-5-4 (next page), the phases are named sequentially "Phase I Conception", "Phase II Planning", "Phase III Execution" and "Phase IV Termination" as seen in the table. There are many types of projects and the "phase" also has aliases like "stage", "step", etc., each of which is inherent in each industry. Each phase has different human resources, quality and quantity of non-human resources, emphasis points of management, risk and other factors relevant to the project. To conduct optimization throughout the life cycle, by taking each of these as a subsystem as viewed from the entire system, and carrying out management to meet the features of each phase, is called life cycle management, or phased management, as outlined below. • Problem solving technique for the entire life cycle. Usually the cost is used as the unit of the evaluation function, and a method of means that becomes its optimization (or maximization or minimization) is chosen. It is important to clarify the scope of the "life" of a project. Notice the consistency of the accuracy of data used. • To determine a specific method or means. • To define an evaluation function, and choose a technique or means to optimize (or maximize). • By choosing a specific method or means, the route of the project is fixed. • A knowledge system to grasp the object and entire project is required. To create ( ) City, with abright future, where the young keep on living, being able to coexist with aged people. • To set up a "digital" library that matches the new life style, capable of being used at midnight and early in the morning as well. • To utilize the land of a primary school that is scheduled to be abolished. • To work out a zone where aged people and the young can coexist. • It will be a publicly built, privately operated PFI. • It will be a building having good cost performance, by accepting the proposals of the contractors as much as possible. • To create a concept, through participation of citizens. • To refer to examples of Europe and America, in which citizens coexist. • It will be kept in use with an assumed life cycle of 20 years. • To minimize the life cycle cost by implementing life cycle assessment. Usually 4 phases, as shown in Table 4-5-4, are employed, and the work to be completed within each phase should be as per the table below. "To be completed" is mentioned based on the idea that in many government organizations or businesses, before advancing to the next phase, there are some checkpoints or gates, regarding which approval should be obtained. This idea is also incorporated in life cycle management. The terms used in many cases are: FS (Feasibility Study) for Conception, Definition/Design for Planning, Production/Procurement & Construction for Execution, and Turnover for Termination. The feature of a project lies in its individuality and uniqueness, and there are no projects that are identical. But the types of projects have similar patterns, which can roughly be divided into the following three: (1) "New development projects" in pharmaceuticals, automobiles, household electric apparatus, etc. where new products are researched and developed with the am of putting them into the market; (2) "Construction and engineering projects" such as building and plant construction; (3) "Software development projects" accompanied by system development aimed at business reform or the improvement of services. In the example given in Table 4-5-5, terms that are frequently used in each industry have been used . These terms are different not only in each industry, but in each business as well, while level of use of human resources throughout the Project Life Cycle and identification of the primary purpose of each Phase are techniques that are generally used. In the new product development projects of pharmaceuticals, automobiles and household electric apparatus, there is the life cycle of fundamental research, applied research, technical development, manufacturing/sales and withdrawal of products. Also, in the construction/engineering projects of plants and buildings, there is the life cycle of conceptual construction, design, procurement, construction, test run, and acceptance/turnover. And while there are various ways of notation in the life cycle of software development projects, by just focusing on the "development" phase out of the planning, development, operation and maintenance and disposal, there is the life cycle of preparation for the start of development, analysis of system requirements, design of system methods, analysis of software requirements, detailed design of software, making of software codes and test, software combination, verification test of software suitability, system combination, verification test of system suitability, introduction of software to the actual machines, preparation for receiving software, and others. 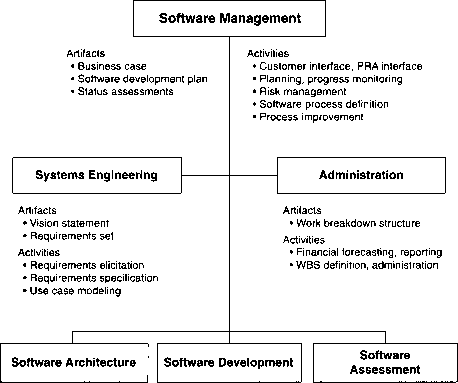 Table 4-5-6 shows an example of life cycle management of a typical software development project. For each Phase it is important to identify which is the main person or organization responsible, the purpose to be achieved, the scope of the Phase and how the beginning and end of the Phase will be signified. The target and role of each phase; if defined accurately, the contents will be a bit different. For example, in a construction/engineering project, it is described from the standpoint of the contractor, and with the premise that the contractor undertakes the construction of the concept of the object up to the turnover of construction upon completion. However, when being seen from the standpoint of the proprietor, the description of the selection of contractors, placing orders and receiving the turnover and operation will be different from this example. Also, a phase itself can be deemed to be one project. In a research and development type project in which a totally new pharmaceutical is invented, or a non-existent technology is developed and put into practical use, there is a rough and conceptual target, but in some cases there is no conviction as to when and with how large a budget it can be accomplished. Even in a project in which the target itself is explored, it will not be carried out without any restriction on time and the budget. Efforts are made to make advances gradually by setting targets in stages. Although this kind of project operation belongs to a field of higher difficulty as project management, research in this area is being conducted. Even though many of these stages are the repetition of trial and error, they are implemented within a project life cycle (PLC) and are defined under certain rules. 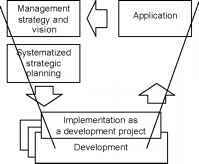 We can say that project management in some ways resembles a top-down management technique in which a rough concept is defined, and as time elapses, the contents are materialized with the input of resources, following the stages from the concept at the upper part toward the details at the lower part, while maintaining harmony throughout. Therefore, details are determined as time elapses, and the amount of information accumulated for attaining the target of the project increases like a geometric progression. It can be understood that if a change in contents occurs while having progressed to a certain point, its impact becomes greater as the time of the change is delayed. Table 4-5-7 (next page) shows that as time elapses, namely as the phase progresses, uncertainties on various aspects such as the specifications, quality, cost, schedule, etc. of the project decrease, and conversely certainties increase, with the result that non-stationary and creative work decreases, and the proportion of stationary work, like piling up blocks, steadily increases. In other words, in order to increase the investment efficiency, even if a large amount of resources is input at the initial stage of the project, by being able to determine project items, a greater reduction of cost can be expected, and changes also decrease, reducing the expenditure associated with the changes as well. To solidify the fundamentals of project items at the initial stage of the project is called pre-project planning (see the Prevention of changes, P.191) or front end planning.